Originally Submitted to FurAffinity.net on January 12th, 2014 06:28 AM. Before it was transferred to Inkbunny it had 1359 views and 277 favorites. When traveling in an area you don't know very well, sometimes it's best to hitch a ride with a local. 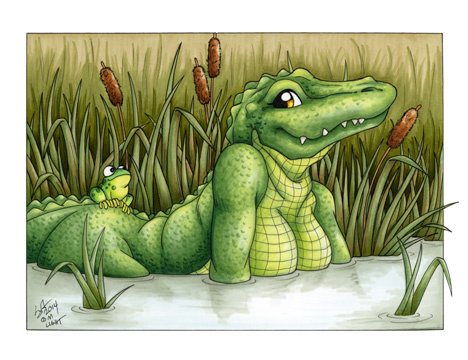 I'm not sure this little frog thought things through when he accepted a ride from a passing alligator. Hopefully he'll hop off before she stops for a bite to eat. One of my new pieces premiering at Further Confusion 2014. Stop by and say "Hi!" if you'll be in San Jose.